All gluten and dairy and refined sugar-free. 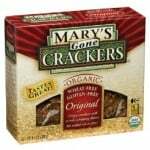 Mary’s Gone Crackers–these aren’t cheap, but they are good, solid gluten free crackers made with seeds and gluten free grains like brown rice and quinoa. A favorite among nutritionists because they’re high in fiber and packed with whole foods goodness. A great alternative to those nasty Saltines or Wheat Thins. 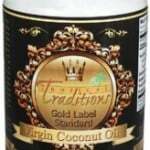 Tropical Traditions Coconut Oil & Cream Concentrate–this is coconut oil at its finest. Coconut oil has so many health benefits and is good for higher temperature stir-frying. Also good for the skin and hair when applied topically. Use the gold label virgin coconut. It should smell like coconuts! The coconut cream concentrate is good for making raw treats, or add warm water and whisk to make coconut milk. 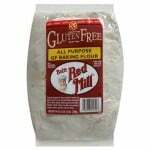 Bob’s Gluten Free Flour–best for baking. I use Pamela’s Gluten free flour mix on occasion too, but it has dried buttermilk (so not for the dairy sensitive) and almond meal in it, so some items come out a little too rich and moist (like banana bread). Pamela’s is good for pancakes or cookies; Bob’s is good for breads or muffins. 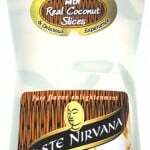 Taste Nirvana Coconut water–if you like coconut water, you HAVE to try this. You’ll never drink the boxed stuff again. Coconut water is great for restoring electrolyte balance; it’s got potassium and magnesium and is pretty low in sugar despite its sweetness. Good for dehydration after workouts, or for the morning after overinduling in the booze to help restore homeostasis. 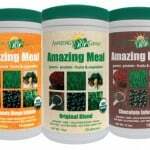 Amazing Grass/Amazing Meal–these folks make a great protein powder and supergreens powder. 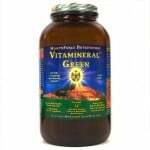 VitaMineral Green–my favorite choice for supergreens. Most nutrient dense. 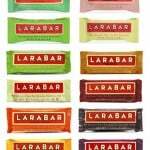 Lara Bars–all natural fruit and nuts. Great to quell sugar cravings. 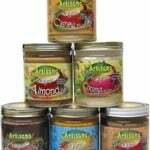 Artisana nut butters–these nut butters are very expensive but very high quality. Good alternatives to almond or peanut butter. They offer raw pecan and cashew butter. The coconut butter is to DIE for and an excellent alternative to butter. There is a cacao coconut butter blend that has goji berries in it that is so delicious.